Get Free Freight on select JBC Soldering Tips (Cartridges). Get this discount when you add an eligible tip to your shopping cart. These popular tips are in stock and ready-to-ship. Our Free Freight promo is valid Monday, June 19, 2017 and runs through Friday, June 23, 2017. Free-shipping-eligible tips are available in a number of cartridge sizes and types with various tip shapes including conical, chisel, curved micro tweezers, spade, and sloped. They are for use with a range of JBC Soldering tools such as the NANO Premium Series Digital Soldering Station, PA Series Micro-Tweezers, DR Series Desoldering Iron, and others. Please visit the individual product pages for more detailed information. 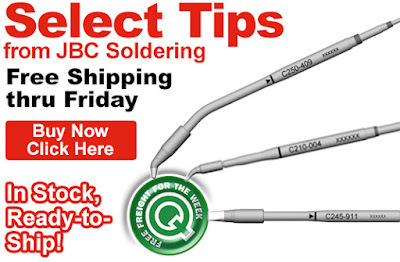 Click here to shop for JBC Soldering Tips. For further questions, call us (800-966-6020), or send us an email. Please note: This promo is valid only at QSource.com and expires on Friday, June 23, 2017.